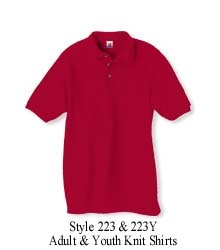 Cardinal Cap and Jacket Co. offers the best of Hanes' knit shirts in the most popular colors and sizes up to 3XL. Made from a blended piqué, these shirts are soft, yet durable. Our knitshirts are perfect for outfitting your employees, team, organization - or yourself! Add custom embroidery to show off your team or company logo. These knit shirts complement the youth version, Style 223Y. Available in six colors shown above. Prices shown are for blank, unembroidered shirts. Direct embroidery up to eight colors is available at an additional cost. Please note: "First-time" embroidery orders will incur a tape charge that may not appear on your web order total. Orders of one embroidered shirt will incur additional charges that will not appear on your web order total. Copyright Cardinal Cap and Jacket Co.. All Rights Reserved. eCommerce Software by 3dcart.